I've had a number of tired, uninspired days lately. Maybe it's the grey of November, maybe it's a lack of exercise, maybe it's well, anything! In any case, some of my days have seemed less than wildly successful. I'd always thought of this verse as referring to the good deeds we do. Today I thought about all the things we DON'T do. That verse somehow struck me differently this time. It talks of service. And good things. I've always thought of those in practical terms like washing the dishes, folding laundry, cleaning up behind others without making snide comments, etc. But today I thought of the things I didn't do. I didn't jump out of bed this morning, ready to take on the day. I didn't put breakfast on the table as early as I should have. I didn't feel organized, I hadn't made a to-do list to keep me on track, I hadn't prepped for my day the evening before, I didn't unload the dishwasher first thing this morning, I didn't even get dressed for a long time, I wasn't motivated or inspired. What I WAS though was tired, unorganized and horribly distracted. And carrying a hefty bag of guilt. 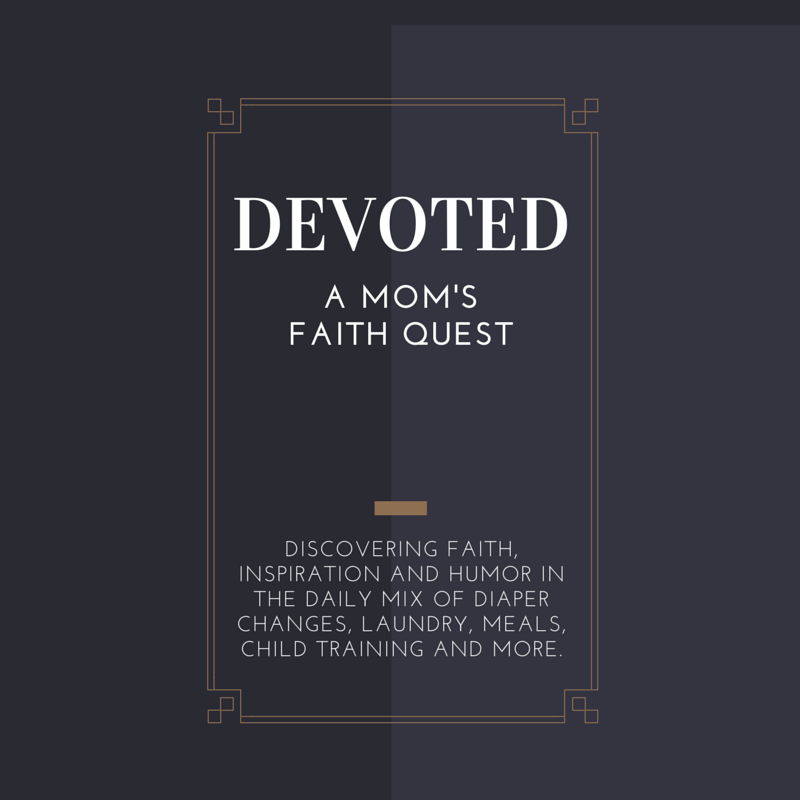 After my little ones were asleep after lunch, I wiped the table, took out my Bible, prayer list and notebook to jot verses in and I had some time with the Savior there at my kitchen/dining/family room/formal dining table. And that's what I saw. That sometimes service is just getting through a tired, uninspired day without doing anything too regrettable. Getting through and maybe even finding grace to clean bathrooms, read extra Pinkalicious and Thomas stories though they bore me terribly, smile at my husband and sing at the sink. Sometimes service is pretty simple. An important aspect of service not to be overlooked is that we're to do it to the Lord and not unto men. Not to ourselves. Not to friends, mother or mother-in-law, author or Pinterest user. WAS IT EASIER BEFORE TECHNOLOGY? Sometimes I wonder what it would be like to have been Grandma and have real live conversation with most of the people she interacted with: when she needed advice, had a question, wanted to find a recipe or make a purchase. Instead of sifting through ebooks, blogs, cooking or children's clothing websites on any given day. Instead of texting and emailing conversations. Wouldn't it have been a teeny bit easier to do service just for the Lord instead of for men/women/friends/family? When the world didn't measure your success or status by your higher education, degree and job? When it was okay to be a stay-at-home mom that didn't even have a job on the side, didn't make or sell anything special? I don't know. I don't think Grandma's life was one bit easy but I think she had that part pretty good, likely without even realizing it. Nevertheless, I'm sure she and all the Roman Christian martyr, Jewish haulocaust and early pioneer mamas throughout history had moments when they wondered if they got enough done in a day. When they, in fact, were sure they didn't. Days when they weren't motivated. And not one of them had a blog or an email account. Most of them didn't have home businesses or jobs of any kind besides the SAHM thing. I'm guessing they had days when their service consisted just in wearing a smile and saying something pleasant. Without sweeping the floor, making a batch of cookies, or going to bed with all the toys picked up. I'm slowly coming to see that service to the Lord might look a lot different than what service looks like to man (or mothers). I suppose I've always known that theoretically, but my heart keeps forgetting. It's beautiful when I do remember. When I realize anew that I don't need to heap on the guilt. I don't need to beat myself over the head. Instead, what I need to do is remind myself who I'm doing this service for. It's the Lord's work. Not my own. Perhaps His work for me today is simply taking time to visit with a friend, read an extra story to my child or say a kind word to my husband and clean the bathroom with the children. It's quite possible He wasn't asking me to jump out of bed today, run efficiently through a to-do list and climb into bed with a spotless kitchen and manicured home. Don't get me wrong. I think there's something to be said for jumping out of bed, organization, efficiency, and to-do lists! But we can't equate those things with God's will for our lives. Some seasons of life may require them to a greater extent, other seasons may be focused more on other things. It's always easy to let the clamoring voices of fear, insecurity, guilt and anxiety override the Holy Spirit's still small voice. It's easy to let others define what service should look like in our lives. However, we can't give in to these demanding voices and real or perceived judgements. We've got to keep in mind that the most important home management tool anyone can have is seeking God's face on a regular basis. And the most important service we can do is the service we do for God, whether that's wiping up yellow paint splatters or catching spilled milk before it runs onto the floor, giving an extra hug and "I love you" or finding the strength to be patient when a child is still awake an hour after lights out. Whatever His work is for us today, it's enough.